← Can creativity save a City? What does it mean to be “Old”? Having lived or existed for a relatively long time; far advanced in years or life, 2)Made long ago; in existence for many years, 3)Having or exhibiting the physical characteristics of age, 4)No longer in general use, 5)Familiar through long acquaintance or repetition, 6)Cherished; dear: used as a term of affection or familiarity, 7)Out-of-date; unfashionable. I’m not sure of the exact age of this bridge. A safe guess is that it is over 100 years old. Is that old, for a bridge? Age can be relative. 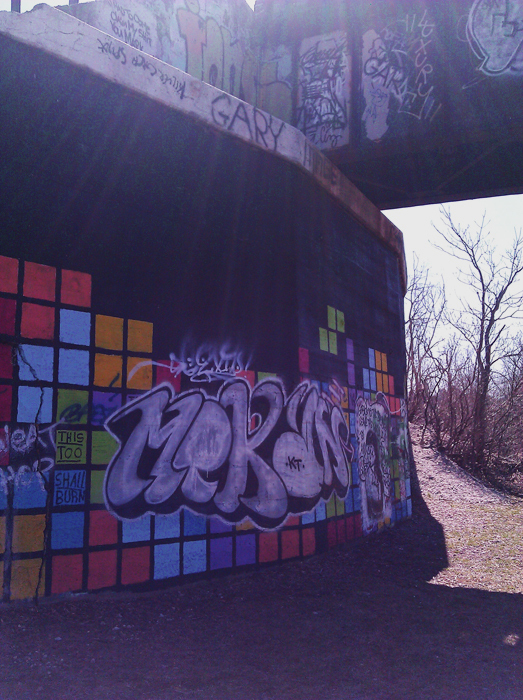 Some of the graffiti on the bridge is new. Well new to me, it wasn’t there the last time I walked past it. How old are your shoes? For a runner logging in 25 miles a week, 3 months may be old for a pair of running shoes. As an artist responding to ‘call to art’ I’m frequently challenged to set aside “old” work. Many competitive exhibits don’t want to show art you created more than 3 years ago. New isn’t always qualitatively better, in my opinion. However, studies have revealed our brain typically seeks out novelty and ignores the old. This entry was posted in graffiti, life and tagged Postaweek2011, Weekly Photo Challenge. Bookmark the permalink.